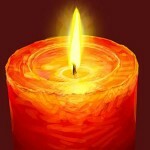 Free Candle Spells | Candle Safety Can Never Be Stressed Enough! I receive a call yesterday, from a client who went to a Botanica, a Latino-based spiritual supply store here in our area. She purchased a series of candles, with numerous bottles of oils to accompany them. In a nutshell, she went home, cleaned her candles and decided to put a whole bottle of oil in each candle, again, thinking that more is better (like using laundry detergent) and lit her candles. She proceeded to go take a shower and when she came out of the bathroom, she said the reflecting flame on the opposite wall from the candles was so big that when she turned the corner, she saw that the whole top of the candle was on fire! She quickly went to douse them, splashing oil and wax from one over her, the bookcase and the wall behind the candle. She got all of the candles out (she was burning three at a time), but it was a VERY close call with all that oil being splashed about. She was very, very lucky. Here are the links to some articles that I have written addressing this issue. I truly hope that something like this never happens to you.